Alas, these last few months have flown by with little time to post. After recuperating from my flurry of summer/fall travel, I've been diligently working on a few new projects, especially a new brainwave study. I've also been amassing chapters from various authors for my upcoming edited book on visual narrative, on its way this time next year (more info soon...), and have been submitting lots of new journal articles. Busy times! Several exciting studies have also been underway with my student researchers, who have coded through various comics of the world (previous works of this type found here). Our projects have so far been looking at page layouts, panel framing, and multimodal interactions. Researchers progress through comics one panel at a time and record properties of the panels, and then we tabulate those numbers and compare samples of comics from different countries, genres, time periods, etc. This is the most effective method of seeing what's going on in the structures of actual comics across the world without hand-waving speculations. Our focus now is turning to narrative patterns. By February, we're hoping to have coding for roughly 200 comics of multiple genres from at least 5 different countries. This should hopefully begin to tell us the scope of various narrative patterns across cultures and what sort of variation might occur between cultures. This study is by far the biggest scope of its kind, but I consider it only a starting point for more extensive works to come. The other exciting thing this quarter has been my bi-weekly "advanced visual language seminar" with my student researchers here at UC San Diego. Here, we've been exploring complex aspects of my theory of narrative grammar that have extended beyond what is in my prior publications, especially with regard to the "semantic structures"—the components that describe a sequences' meaning. 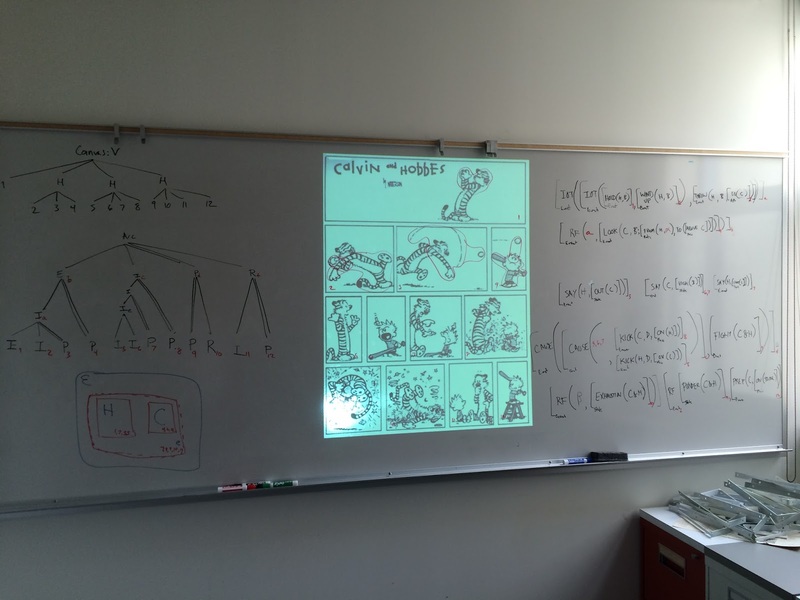 Once we established the basic theories, we have put them to use by analyzing various pages from comics, like the Calvin and Hobbes page above. Our recent method has been to randomly choose pages from my database of comics and then analyze it across multiple structures: graphic structure (the lines on the page), page layout, narrative structure, spatial structure, conceptual structure. We then show how all these structures interact. Either because or despite this complexity, this practice is actually fairly fun. I think working through these structures may be the best way to appreciate and get a handle on what is actually going on in the structure of this visual language. For those interested in more, further examples and descriptions of these interactions can be found in my recent review paper, online here. Hopefully papers (and maybe a book?) can better address all this in years to come. Igor Kordey's "Design of comics"